Stage curtain for the ballet Parade. It seems that nothing is missing. 1917 meets all the requirements to become the must-see exhibition about the creativity during the Great War. It is often preferable when the curators narrow to the utmost the span of time comtemplated by an exhibition, like they did in this case: in this way it becomes easier to figure out what the creative activity meant during a certain period. 1917 represents the so called "annus horribilis" and is worldwide studied as the turning year of the war, not only because of the United States entering the operations, the Fourteen points of President Wilson or, looking eastwards, the bolshevik revolution in Russia. The works here displayed belong to public, private, art and military collections. The icing on the cake is for sure Picasso's stage curtain for the ballet Parade (a huge canvas measuring 10.5 by 16.4 metres). This is Picasso's largest work and was commissioned to the spanish artist by the director of Ballets Russes, Sergei Diaghilev. 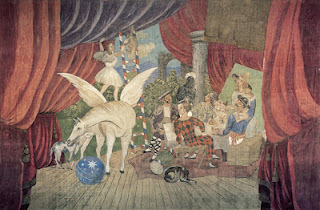 The ballet featured a scenario by Jean Cocteau and music by Erik Satie. Today we can admire it keeping in mind what Apollinaire wrote about this total work of art: "for the first time this union of painting and dance, costume and theatre which hails the advent of a more complete form of art." This 2300 square meter exhibition is hosted in Gallery 1 and in the Grande Nef of the Centre Pompidou-Metz. The first gallery tries to map the positions of almost 800 artists introducing a layout aiming to develop the themes of injury, violence, physical and symbolic distance from battlefields and trench art. The second section, hosted in the Grande Nef, swings between the opposite motifs of destruction and reconstruction (dwelling on faces, bodies, war artefacts and buildings) in a special layout resembling a spiral, a frequent form in the art of that year (think about Futurism and, before the war's outbreak, about Vorticism).